Dr. Barbara A. Block holds the Charles and Elizabeth Prothro Professorship at Stanford University. 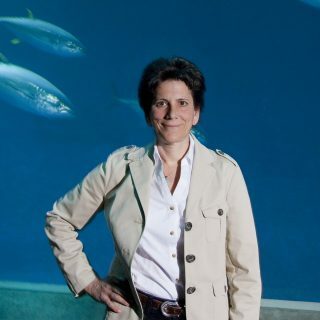 Her research is focused on how large pelagic fish utilize the open ocean spanning from genomics to biologging. She and her team have pioneered the successful development and deployment of electronic tags on tunas, billfishes and sharks. The combination of lab and field research has led to a rapid increase in the understanding of movement patterns, population structure, physiology and behaviors of pelagic fish and sharks. Dr. Block was Chief Scientist for the Tagging of Pacific Predators program (TOPP), organized under the Census of Marine Life. This international program, succeeded in placing 4000 electronic tags on 23 predators in the North Pacific to understand how pelagic animals use the North Pacific ecosystem. Block began her oceanographic career at Woods Hole Oceanographic Institution with Dr. Francis Carey. She earned a Ph.D. in 1986 at Duke University. She was an assistant professor at the University of Chicago and joined the Stanford faculty in 1994. Block has published 200 peer reviewed papers and has received the NSF Young Investigator Award, a MacArthur Fellowship, a Pew Fellowship for Marine conservation, the Rolex Award for Enterprise, and a Benchely Award for Ocean Science. Block founded the Tag-A-Giant (TAG) at The Ocean Foundation to elevate the science and conservation initiatives for bluefin tunas globally. Block has helped produce 5 films with Discovery, Disney and Nat Geo, the most recent award winning film on white sharks is called Blue Serengeti.